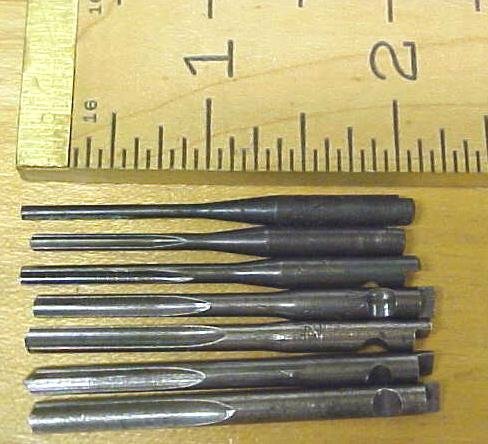 Offering this hard to find Yankee push drill, straight fluted points set of 7 drill points. The price is for one set of 7 new old stock drill points, but if more are available, you may order more than one and save on shipping. This is a set of 7 points from 5/64"-11/64" diameter, and are about 2.1" long overall. The shank size is .168" diameter, so check your push drill chuck to be sure of the correct size. There may be some slight color variations between set, depending on where and when they were made, as some of the older stock were bright finished, instead of the blued finish. These will fit North Brothers or Stanley push drills, No. 35, 40, 41, 41Y 42, 43, 44, 45, & 46, & 03-046 and will also fit some Yankee screwdrivers by this same company if you have the correct Yankee adapter, made by North Brothers or Stanley. 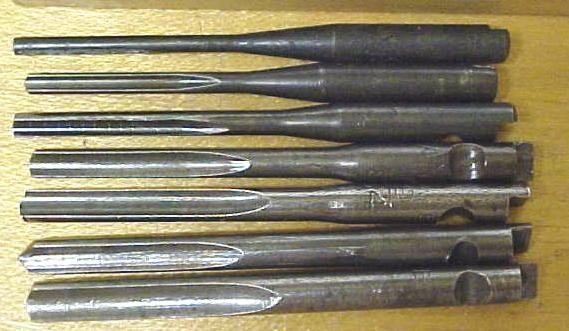 These also fit some Craftsman, and Millers Falls push drills with the same shank notch and flat. These drill points are no longer manufactured, so we also carry a straight drill shank adapter that you can purchase as an option to purchasing these hard to find Yankee bits. You can learn more about the adapters, by searching this site for Yankee Straight shank adapter. If you use your push drill often, the drill adapter is the way to go! Items Similar To "Yankee Push Drill Point Set Drill Bit Set of 7"